As they say, necessity is the mother of invention. So when David Burder, CEO of Whitlands Engineering , needed to split 25m3 tons of wood per year for his home heater, the handy old axe didn’t quite cut it. 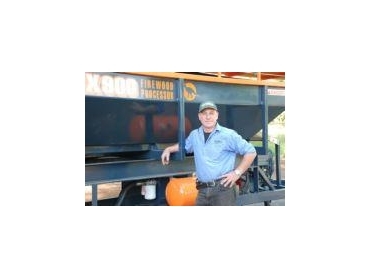 It took David 2 years to design what is now Australia’s Number One wood splitter – The Superaxe. Awarded ‘Farm Inventor of the Year’ in 2003, David now employs 16 full time staff - manufacturing and designing a whole range of firewood processing equipment. The philosophy behind Whitlands Engineering is simple: good design, built to last and efficient and easy to use. The range of fire wood equipment designed by Whitlands Engineering covers all bases. The Aussie Chopper range – designed for domestic and hire use, features a vertical action sliding blade, log lifter and a 6 (or 9) hp Subaru engine – a great option for those wanting to own their own wood splitter. The Superaxe range of wood splitters is different, in that the blade pivots, rather than slides – resulting in more power at the base of the blade. The Superaxe is available in 3 sizes (300/400 & 450) and has been proven to split the toughest Australian hard wood. Both the Aussie Chopper and Superaxe wood splitters feature heavy-duty construction and come with a 2-year warranty. Other features include the back saving log lifter, the safe two-handed control system, plus other optional extras. A few years ago David ventured into new territory – designing commercial firewood processing equipment. The REX Firewood Processor and the REX Log Saw are the result of many years’ research and development and have been met with industry acclaim. The Rex Firewood Processors are on the way to revolutionising the commercial fire wood industry. So, from humble beginnings, Whitlands Engineering is a true-blue Aussie wood splitter success story.